I was excited to see them show up because it means that fall is happening. I live in New England, capital of awesome fall, and so I get goosebumps when I see those orange pumpkins. Of course, you can cook with canned pumpkin all year round, but this is the time of year we think of it because of (dare I say it?) pumpkin pie. In my usual Overnight Pancake Recipe, I use yogurt to give a nice flavor. I replaced the yogurt with pureed pumpkin from a can and used a little more sugar to make it sweeter. 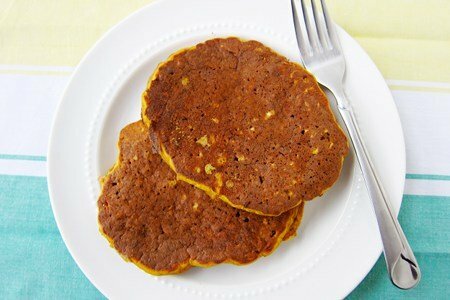 The result is a bright orange pancake with 66% of your daily value of Vitamin A and 7% of your daily value of iron. It does taste a bit like pumpkin pie! I should warn you that when I took this out of the fridge it was GREEN. Yikes! The very top of the batter looked like something out of a horror movie. Oh no.... but, then I stirred it and it went away. I am thinking the top layer oxidized a bit and it didn’t affect the color or flavor in the end. It is truly lovely to have pancake batter waiting for you in the morning. I find that I hop out of bed faster when I know that I am going to make a hot breakfast and all I have to do is heat the pan. The house smells great and (sometimes) I don't have to wake my kids. They just wander out wondering what is cooking. Have you tried to make any pumpkin recipes yet? How is it going? Mix ingredients together in a large bowl. Place in refrigerator overnight. In the morning, pour batter (about ¼ cup for each pancake) in a heated non-stick pan until bubbles begin showing on the surface. Turn pancake over with spatula - wait 2 minutes and serve. Good morning, Snack Girl, I just wanted to let you know I enjoy your site and especially the content. I'm 59 (soon to be 60!) but I've always been super interested in nutrition and health. I took up surfing at 54 and moved to Costa Rica the same year to surf and live in the rain forest. Eating healthy was relatively easy as there is a lot of fruit and beans and rice are the mainstay. Do you eat these plain or top with some sort of syrup? I love anything pumpkin and cannot wait to try these. We may have then for dinner! Thank you for sharing your experience. I'm 48 years old and lately I've been mourning my youth. Yes, I accomplished some goals but where was the fun and adventure? I'm determined to make the most out of life from now on so thank you for reminding me that these years are meant to be enjoyed! Having a site like this one makes making healthy choices easier. Yummy. Love the idea of making the batter the night before then just cooking in the morning. Last night I made pumpkin Mac & "Cheese". I actually did not use any cheese, just pumpkin, flour & almond milk...poured over pasta and baked. It was creamy and yummy and I did not miss the cheese. @Kimberly - these can go savory or sweet. I eat these with a dollop of plain yogurt or maple syrup (or both). I bet these would be good with cheese. But, I think every thing tastes good with cheese. Thanks for your question! Great reminder, Snack Girl! And, for those with chronic illness, and/or autoimmune challenges, or weight concerns, staying away from the processed flours and processed dairy is vital. Choose almond meal or coconut flour instead and a healthy nut milk such as unsweetened almond or coconut. Yum! Mmmmmm...I can't wait to try them! I made your No Bake Pumpkin, Raisin, Oatmeal cookies last week and thoroughly enjoyed eating one or two (okay, sometimes three!) a day until they were gone. These look delicious! I may try and make some alterations (maple syrup instead of sugar, almond milk instead of milk, and flax eggs instead of regular eggs) and hopefully they will turn out as yummy! Every year I go crazy with pumpkin (seems like a lot of people do)and end up with multiple cans leftover in the pantry. Now I can put them to good use!! I have made pumpkin pancakes with many of my youth groups and we have also put mini chocolate chips in them and we found you don't need any butter or syrup, plenty sweet enough. Of course we made them the size of CD (serving size for a Pancake)2 pancakes a serving. Love the idea of chocolate chips. I will use cacao nips with unsweetened applesauce. Plan to make them this weekend. It's fall and I am loving pumpkin!! Thanks for a great pumpkin recipe SG...we will try it for our weekend pancakes.